These old-fashioned apple cookies are made with sour cream, raisins, and butter, which gives them their mouthwatering flavor and texture. These are the cookies our grandparents loved, and the cookies many of us grew up with. They're also versatile; add dried cranberries to replace the raisins. Or fold about 1/2 cup of chopped walnuts into the final batter. There are no spices in these cookies, but a little cinnamon sugar sprinkled over the tops before baking would add a nice finishing touch. Or add 1 teaspoon of cinnamon and a dash of nutmeg to the batter along with the flour mixture. See more possible variations and some optional icing ideas below the recipe. Heat the oven to 375° F (190° C/Gas 5). Grease a baking sheet or line it with parchment paper or a silicone baking mat. In a mixing bowl with an electric mixer, cream the softened butter with the granulated and brown sugars until light and fluffy. Beat in the egg and vanilla. In another bowl combine the flour, baking powder, soda, and salt. Stir with a whisk to blend thoroughly. Add the flour mixture to the creamed mixture alternately with sour cream, beating after each addition. Stir in the raisins and chopped apples. Drop the cookie dough by teaspoons onto the prepared baking sheet. Makes about 3 dozen apple cookies. 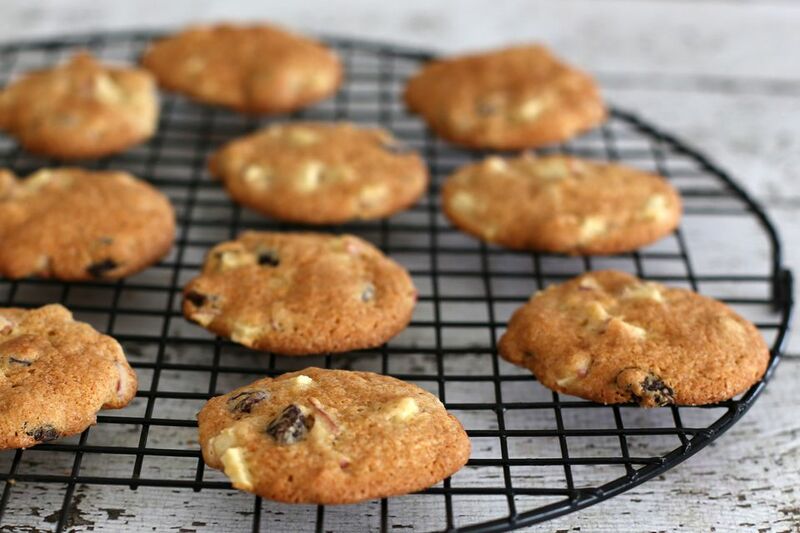 Cranberry Apple Cookies - Substitute dried cranberries or craisins for the raisins. Apple Raisin Nut Cookies - Add 1/2 cup of chopped walnuts or pecans along with the apples and raisins. Orange Icing - Combine 1 cups of powdered sugar with 1 tablespoon of melted butter and about 2 tablespoons of orange juice concentrate or regular orange juice. Add more powdered sugar, as needed, to make a drizzling consistency. Vanilla Icing - Combine 1 cup of powdered sugar with 1 tablespoon of melted butter, 1/2 teaspoon of vanilla extract, and 1 to 2 tablespoons of hot water. Caramel Icing - Combine 3/4 cup of powdered sugar with 2 tablespoons of caramel ice cream sauce, 1 tablespoon of butter, and enough milk to make it thin enough to drizzle over the cookies.